For the scientific journal, see Physiology (journal). Physiology (/ˌfɪziˈɒlədʒi/; from Ancient Greek φύσις (physis), meaning 'nature, origin', and -λογία (-logia), meaning 'study of') is the scientific study of the functions and mechanisms which work within a living system. As a sub-discipline of biology, the focus of physiology is on how organisms, organ systems, organs, cells, and biomolecules carry out the chemical and physical functions that exist in a living system. Central to an understanding of physiological functioning is the investigation of the fundamental biophysical and biochemical phenomena, the coordinated homeostatic control mechanisms, and the continuous communication between cells. The physiologic state is the condition occurring from normal body function, while the pathological state is centered on the abnormalities that occur in animal diseases, including humans. According to the type of investigated organisms, the field can be divided into, animal physiology (including that of humans), plant physiology, cellular physiology and microbial physiology. The Nobel Prize in Physiology or Medicine is awarded to those who make significant achievements in this discipline by the Royal Swedish Academy of Sciences. Human physiology seeks to understand the mechanisms that work to keep the human body alive and functioning, through scientific enquiry into the nature of mechanical, physical, and biochemical functions of humans, their organs, and the cells of which they are composed. The principal level of focus of physiology is at the level of organs and systems within systems. The endocrine and nervous systems play major roles in the reception and transmission of signals that integrate function in animals. Homeostasis is a major aspect with regard to such interactions within plants as well as animals. The biological basis of the study of physiology, integration refers to the overlap of many functions of the systems of the human body, as well as its accompanied form. It is achieved through communication that occurs in a variety of ways, both electrical and chemical. Changes in physiology can impact the mental functions of individuals. Examples of this would be the effects of certain medications or toxic levels of substances. Change in behavior as a result of these substances is often used to assess the health of individuals. Much of the foundation of knowledge in human physiology was provided by animal experimentation. Due to the frequent connection between form and function, physiology and anatomy are intrinsically linked and are studied in tandem as part of a medical curriculum. Plant physiology is a subdiscipline of botany concerned with the functioning of plants. Closely related fields include plant morphology, plant ecology, phytochemistry, cell biology, genetics, biophysics, and molecular biology. Fundamental processes of plant physiology include photosynthesis, respiration, plant nutrition, tropisms, nastic movements, photoperiodism, photomorphogenesis, circadian rhythms, seed germination, dormancy, and stomata function and transpiration. Absorption of water by roots, production of food in the leaves, and growth of shoots towards light are examples of plant physiology. Although there are differences between animal, plant, and microbial cells, the basic physiological functions of cells can be divided into the processes of cell division, cell signaling, cell growth, and cell metabolism. Microorganisms can be found almost everywhere on Earth. Types of microorganisms include archaea, bacteria, eukaryotes, protists, fungi, and micro-plants. Microbes are important in human culture and health in many ways, serving to ferment foods, treat sewage, produce fuel, enzymes and other bioactive compounds. They are essential tools in biology as model organisms and have been put to use in biological warfare and bioterrorism. They are a vital component of fertile soils. In the human body microorganisms make up the human microbiota including the essential gut flora. They are the pathogens responsible for many infectious diseases and as such are the target of hygiene measures. Most microorganisms can reproduce rapidly, and bacteria are also able to freely exchange genes through conjugation, transformation and transduction, even between widely divergent species. The study of human physiology as a medical field originates in classical Greece, at the time of Hippocrates (late 5th century BC). Outside of Western tradition, early forms of physiology or anatomy can be reconstructed as having been present at around the same time in China, India and elsewhere. Hippocrates incorporated his belief system called the theory of humours, which consisted of four basic substance: earth, water, air and fire. Each substance is known for having a corresponding humour: black bile, phlegm, blood and yellow bile, respectively. Hippocrates also noted some emotional connections to the four humours, which Claudius Galenus would later expand on. The critical thinking of Aristotle and his emphasis on the relationship between structure and function marked the beginning of physiology in Ancient Greece. Like Hippocrates, Aristotle took to the humoral theory of disease, which also consisted of four primary qualities in life: hot, cold, wet and dry. Claudius Galenus (c. 130–200 AD), known as Galen of Pergamum, was the first to use experiments to probe the functions of the body. Unlike Hippocrates, Galen argued that humoral imbalances can be located in specific organs, including the entire body. His modification of this theory better equipped doctors to make more precise diagnoses. Galen also played off of Hippocrates idea that emotions were also tied to the humours, and added the notion of temperaments: sanguine corresponds with blood; phlegmatic is tied to phlegm; yellow bile is connected to choleric; and black bile corresponds with melancholy. Galen also saw the human body consisting of three connected systems: the brain and nerves, which are responsible for thoughts and sensations; the heart and arteries, which give life; and the liver and veins, which can be attributed to nutrition and growth. Galen was also the founder of experimental physiology. And for the next 1,400 years, Galenic physiology was a powerful and influential tool in medicine. Jean Fernel (1497–1558), a French physician, introduced the term "physiology". Galen, Ibn al-Nafis, Michael Servetus, Realdo Colombo, Amato Lusitano and William Harvey, are credited as making important discoveries in the circulation of the blood. Santorio Santorio in 1610s was the first to use a device to measure the pulse rate (the pulsilogium), and a thermoscope to measure temperature. In 1791 Luigi Galvani described the role of electricity in nerves of dissected frogs. In 1811, Julien Jean César Legallois studied respiration in animal dissection and lesions and found the center of respiration in the medulla oblongata. In the same year, Charles Bell finished work on what would later become known as the Bell-Magendie law, which compared functional differences between dorsal and ventral roots of the spinal cord. In 1824, François Magendie described the sensory roots and produced the first evidence of the cerebellum’s role in equilibration to complete the Bell-Magendie law. In the 1820s, the French physiologist Henri Milne-Edwards introduced the notion of physiological division of labor, which allowed to "compare and study living things as if they were machines created by the industry of man." Inspired in the work of Adam Smith, Milne-Edwards wrote that the "body of all living beings, whether animal or plant, resembles a factory ... where the organs, comparable to workers, work incessantly to produce the phenomena that constitute the life of the individual." In more differentiated organisms, the functional labor could be apportioned between different instruments or systems (called by him as appareils). In 1858, Joseph Lister studied the cause of blood coagulation and inflammation that resulted after previous injuries and surgical wounds. He later discovered and implemented antiseptics in the operating room, and as a result decreased death rate from surgery by a substantial amount. The Physiological Society was founded in London in 1876 as a dining club. The American Physiological Society (APS) is a nonprofit organization that was founded in 1887. The Society is, "devoted to fostering education, scientific research, and dissemination of information in the physiological sciences." In 1891, Ivan Pavlov performed research on "conditional responses" that involved dogs' saliva production in response to a bell and visual stimuli. In the 19th century, physiological knowledge began to accumulate at a rapid rate, in particular with the 1838 appearance of the Cell theory of Matthias Schleiden and Theodor Schwann. It radically stated that organisms are made up of units called cells. Claude Bernard's (1813–1878) further discoveries ultimately led to his concept of milieu interieur (internal environment), which would later be taken up and championed as "homeostasis" by American physiologist Walter B. Cannon in 1929. By homeostasis, Cannon meant "the maintenance of steady states in the body and the physiological processes through which they are regulated." In other words, the body's ability to regulate its internal environment. William Beaumont was the first American to utilize the practical application of physiology. Nineteenth century physiologists such as Michael Foster, Max Verworn, and Alfred Binet, based on Haeckel's ideas, elaborated what came to be called "general physiology", a unified science of life based on the cell actions, later renamed in the 20th century as cell biology. In the 20th century, biologists became interested in how organisms other than human beings function, eventually spawning the fields of comparative physiology and ecophysiology. Major figures in these fields include Knut Schmidt-Nielsen and George Bartholomew. Most recently, evolutionary physiology has become a distinct subdiscipline. In 1920, August Krogh won the Nobel Prize for discovering how, in capillaries, blood flow is regulated. In 1954, Andrew Huxley and Hugh Huxley, alongside their research team, discovered the sliding filaments in skeletal muscle, known today as the sliding filament theory. Recently, there have been intense debates about the vitality of physiology as a discipline (Is it dead or alive?). If physiology is perhaps less visible nowadays than during the golden age of the 19th century, it is in large part because the field has given birth to some of the most active domains of today's biological sciences, such as neuroscience, endocrinology, and immunology. Furthermore, physiology is still often seen as an integrative discipline, which can put together into a coherent framework data coming from various different domains. Initially, women were largely excluded from official involvement in any physiological society. The American Physiological Society, for example, was founded in 1887 and included only men in its ranks. In 1902, the American Physiological Society elected Ida Hyde as the first female member of the society. Hyde, a representative of the American Association of University Women and a global advocate for gender equality in education, attempted to promote gender equality in every aspect of science and medicine. Gerty Cori, along with husband Carl Cori, received the Nobel Prize in Physiology or Medicine in 1947 for their discovery of the phosphate-containing form of glucose known as glycogen, as well as its function within eukaryotic metabolic mechanisms for energy production. Moreover, they discovered the Cori cycle, also known as the Lactic acid cycle, which describes how muscle tissue converts glycogen into lactic acid via lactic acid fermentation. Barbara McClintock was rewarded the 1983 Nobel Prize in Physiology or Medicine for the discovery of genetic transposition McClintock is the only female recipient who has won an unshared Nobel Prize. Gertrude Elion, along with George Hitchings and Sir James Black, received the Nobel Prize for Physiology or Medicine in 1988 for their development of drugs employed in the treatment of several major diseases, such as leukemia, some autoimmune disorders, gout, malaria, and viral herpes. Linda B. Buck, along with Richard Axel, received the Nobel Prize in Physiology or Medicine in 2004 for their discovery of odorant receptors and the complex organization of the olfactory system. Françoise Barré-Sinoussi, along with Luc Montagnier, received the Nobel Prize in Physiology or Medicine in 2008 for their work on the identification of the Human Immunodeficiency Virus (HIV), the cause of Acquired Immunodeficiency Syndrome (AIDS). Elizabeth Blackburn, along with Carol W. Greider and Jack W. Szostak, was awarded the 2009 Nobel Prize for Physiology or Medicine for the discovery of the genetic composition and function of telomeres and the enzyme called telomerase. ^ "physiology". Online Etymology Dictionary. ^ hvs1001@cam.ac.uk. "What is physiology? — Faculty of Biology". biology.cam.ac.uk. Retrieved 2018-07-07. ^ Prosser, C. Ladd (1991). Comparative Animal Physiology, Environmental and Metabolic Animal Physiology (4th ed.). Hoboken, NJ: Wiley-Liss. pp. 1–12. ISBN 978-0-471-85767-9. ^ a b c Hall, John (2011). Guyton and Hall textbook of medical physiology (12th ed.). Philadelphia, Pa.: Saunders/Elsevier. p. 3. ISBN 978-1-4160-4574-8. ^ Widmaier, Eric P.; Raff, Hershel; Strang, Kevin T. (2016). Vander's Human Physiology The Mechanisms of Body Function. New York, NY: McGraw-Hill Education. pp. 14–15. ISBN 978-1-259-29409-9. ^ a b "What is physiology?". Medical News Today. ^ Pereda, AE (April 2014). "Electrical synapses and their functional interactions with chemical synapses". Nature Reviews. Neuroscience. 15 (4): 250–63. doi:10.1038/nrn3708. PMC 4091911. PMID 24619342. ^ "Mental disorders". World Health Organization. WHO. Retrieved 15 April 2017. ^ "Eszopiclone" (PDF). F.A. Davis. 2017. Retrieved April 15, 2017. ^ "Zolpidem" (PDF). F.A. Davis. Retrieved April 15, 2017. ^ Bergman, Esther M; de Bruin, Anique BH; Herrler, Andreas; Verheijen, Inge WH; Scherpbier, Albert JJA; van der Vleuten, Cees PM (19 November 2013). "Students' perceptions of anatomy across the undergraduate problem-based learning medical curriculum: a phenomenographical study". BMC Medical Education. 13: 152. doi:10.1186/1472-6920-13-152. PMC 4225514. PMID 24252155. Together with physiology and biochemistry, anatomy is one of the basic sciences that are to be taught in the medical curriculum. ^ Zyga, Lisa. "We are living in a bacterial world, and it's impacting us more than previously thought". phys.org. Science X. Retrieved 16 January 2019. ^ "Physiology". Science Clarified. Advameg, Inc. Retrieved 2010-08-29. ^ Helaine Selin, Medicine Across Cultures: History and Practice of Medicine in Non-Western Cultures (2003), p. 53. ^ D. P. Burma; Maharani Chakravorty. From Physiology and Chemistry to Biochemistry. Pearson Education. p. 8. ^ "Early Medicine and Physiology". ship.edu. ^ a b c "Galen of Pergamum". Encyclopædia Britannica. ^ Fell, C.; Pearson, F. (November 2007). "Historical Perspectives of Thoracic Anatomy". Thoracic Surgery Clinics. 17 (4): 443–8. doi:10.1016/j.thorsurg.2006.12.001. PMID 18271159. ^ Wilbur Applebaum (2000). Encyclopedia of the Scientific Revolution: From Copernicus to Newton. Routledge. p. 344. Bibcode:2000esrc.book.....A. ^ Rampling, M. W. (2016). "The history of the theory of the circulation of the blood". Clinical Hemorheology and Microcirculation. 64 (4): 541–549. doi:10.3233/CH-168031. ISSN 1875-8622. PMID 27791994. ^ "Santorio Santorio (1561-1636): Medicina statica". Vaulted Treasures. University of Virginia, Claude Moore Health Sciences Library. ^ a b R. M. Brain. The Pulse of Modernism: Physiological Aesthetics in Fin-de-Siècle Europe. Seattle: University of Washington Press, 2015. 384 pp., . ^ a b c d "Milestones in Physiology (1822-2013)" (PDF). 1 October 2013. Retrieved 2015-07-25. ^ "The Society's history | Physiological Society". physoc.org. Retrieved 2017-02-21. ^ "American Physiological Society > About". the-aps.org. Retrieved 2017-02-21. 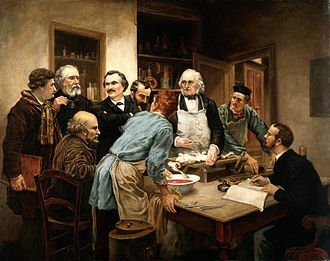 ^ Bernard, Claude (1865). An Introduction to the Study of Ex- perimental Medicine. New York: Dover Publications (published 1957). ^ Bernard, Claude (1878). Lectures on the Phenomena of Life Common to Animals and Plants. Springfield: Thomas (published 1974). ^ Brown Theodore M.; Fee Elizabeth (October 2002). "Walter Bradford Cannon: Pioneer Physiologist of Human Emotions". American Journal of Public Health. 92 (10): 1594–1595. doi:10.2105/ajph.92.10.1594. PMC 1447286. ^ Heilbron, J. L. (2003). The Oxford Companion to the History of Modern Science, Oxford University Press, p. 649, link. ^ Feder, ME; Bennett, AF; WW, Burggren; Huey, RB (1987). New directions in ecological physiology. New York: Cambridge University Press. ISBN 978-0-521-34938-3. ^ Garland, Jr, Theodore; Carter, P. A. (1994). "Evolutionary physiology" (PDF). Annual Review of Physiology. 56 (1): 579–621. doi:10.1146/annurev.ph.56.030194.003051. PMID 8010752. ^ Pinter, G. G.; Pinter, V. (1993). "Is Physiology a Dying Discipline?". Physiology. 8 (2): 94–95. doi:10.1152/physiologyonline.1993.8.2.94. ^ a b Lemoine, Maël; Pradeu, Thomas (2018-07-01). "Dissecting the Meanings of "Physiology" to Assess the Vitality of the Discipline". Physiology. 33 (4): 236–245. doi:10.1152/physiol.00015.2018. ISSN 1548-9221. PMID 29873600. ^ Kremer, Richard L. (2009). "Physiology". In Bowler & Pickstone. The Cambridge History of the Modern Biological and Earth Science. Cambridge: Cambridge University Press. pp. 342–366. doi:10.1017/CHOL9780521572019.019. ISBN 9781139056007. ^ Noble, Denis (2013). "More on Physiology Without Borders". Physiology. 28 (1): 2–3. doi:10.1152/physiol.00044.2012. ISSN 1548-9213. PMID 23280350. ^ Neill, Jimmy D.; Benos, Dale J. (1993). "Relationship of Molecular Biology to Integrative Physiology". Physiology. 8 (5): 233–235. doi:10.1152/physiologyonline.1993.8.5.233. ^ Noble, Denis (2002-03-01). "Modeling the Heart--from Genes to Cells to the Whole Organ". Science. 295 (5560): 1678–1682. Bibcode:2002Sci...295.1678N. doi:10.1126/science.1069881. ISSN 0036-8075. PMID 11872832. ^ "American Physiological Society > Founders". the-aps.org. The American Physiological Society. ^ Tucker, GS (December 1981). "Ida Henrietta Hyde: the first woman member of the society" (PDF). The Physiologist. 24 (6): 1–9. PMID 7043502. ^ "Ida Henrietta Hyde". jwa.org. ^ "Women in Physiology | Physiological Society". physoc.org. Retrieved 2018-01-11. ^ "Women in Physiology". physoc.org. ^ "Carl Cori and Gerty Cori". Encyclopædia Britannica. ^ "Facts on the Nobel Prizes in Physiology and Medicine". nobelprize.org. Nobel Media AB. Retrieved 2016-09-23. ^ "Gertrude B. Elion". Encyclopædia Britannica. ^ "The Nobel Prize in Physiology or Medicine 2004". nobelprize.org. ^ "Francoise Barre-Sinoussi - biography - French virologist". Encyclopædia Britannica. ^ "Elizabeth H. Blackburn". Encyclopædia Britannica. ^ "Carol W. Greider". Encyclopædia Britannica. ^ Moyes, C.D., Schulte, P.M. Principles of Animal Physiology, second edition. Pearson/Benjamin Cummings. Boston, MA, 2008. Look up physiology in Wiktionary, the free dictionary. Widmaier, E.P., Raff, H., Strang, K.T. Vander's Human Physiology. 11th Edition, McGraw-Hill, 2009. Marieb, E.N. Essentials of Human Anatomy and Physiology. 10th Edition, Benjamin Cummings, 2012. Hill, R.W., Wyse, G.A., Anderson, M. Animal Physiology, 3rd ed. Sinauer Associates, Sunderland, 2012. Moyes, C.D., Schulte, P.M. Principles of Animal Physiology, second edition. Pearson/Benjamin Cummings. Boston, MA, 2008. Randall, D., Burggren, W., and French, K. Eckert Animal Physiology: Mechanism and Adaptation, 5th Edition. W.H. Freeman and Company, 2002. Schmidt-Nielsen, K. Animal Physiology: Adaptation and Environment. Cambridge & New York: Cambridge University Press, 1997. Withers, P.C. Comparative animal physiology. Saunders College Publishing, New York, 1992. Larcher, W. Physiological plant ecology (4th ed.). Springer, 2001. Taiz, L., Zieger, E. Plant Physiology (5th ed. ), Sunderland, Massachusetts: Sinauer, 2010. Griffin, D.H. Fungal Physiology, Second Edition. Wiley-Liss, New York, 1994. Levandowsky, M. Physiological Adaptations of Protists. In: Cell physiology sourcebook: essentials of membrane biophysics. Amsterdam; Boston: Elsevier/AP, 2012. Levandowski, M., Hutner, S.H. (eds). Biochemistry and physiology of protozoa. Volumes 1, 2, and 3. Academic Press: New York, NY, 1979; 2nd ed. Laybourn-Parry J. A Functional Biology of Free-Living Protozoa. Berkeley, California: University of California Press; 1984. Lobban, C.S., Harrison, P.J. Seaweed ecology and physiology. Cambridge University Press, 1997. Stewart, W. D. P. (ed.). Algal Physiology and Biochemistry. Blackwell Scientific Publications, Oxford, 1974. El-Sharoud, W. (ed.). Bacterial Physiology: A Molecular Approach. Springer-Verlag, Berlin-Heidelberg, 2008. Kim, B.H., Gadd, M.G. Bacterial Physiology and Metabolism. Cambridge, 2008. Moat, A.G., Foster, J.W., Spector, M.P. Microbial Physiology, 4th ed. Wiley-Liss, Inc. New York, NY, 2002.